Byliner is a publishing company and social network built around great stories. Byliner publishes original narratives by some of the most accomplished writers working today, at lengths that allow them to be read in a single sitting. Called Byliner Originals, these stories typically range between 10,000 and 35,000 words and are available in digital form, with select titles also available as audio or print-on-demand books. They tackle compelling stories from the worlds of culture, technology, politics, business, sports, science, crime, adventure, and more. 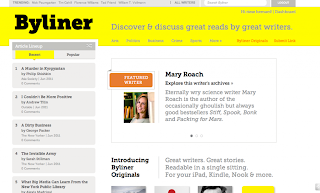 On Byliner.com, readers can discover, share, and discuss stories with a community of fellow readers, receive personalized recommendations, and follow their favorite writers — ensuring that they never miss a great read. 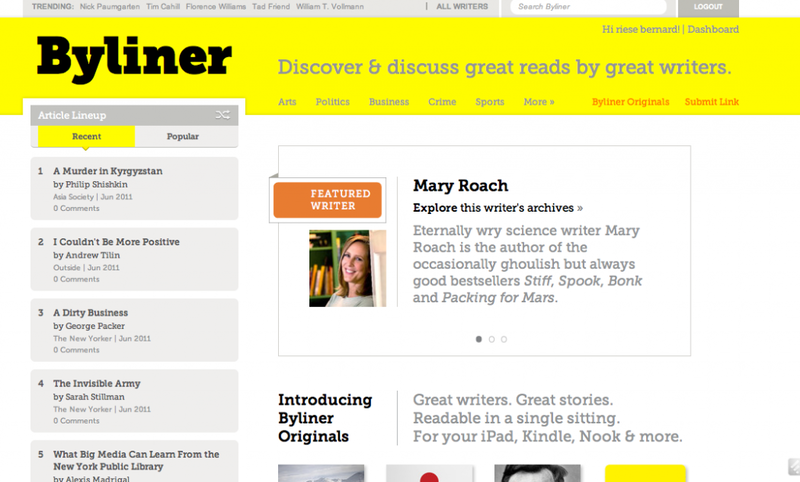 Byliner.com also acts as a platform for writers, enabling them to connect directly with their audience. We’ll find you something good to read. 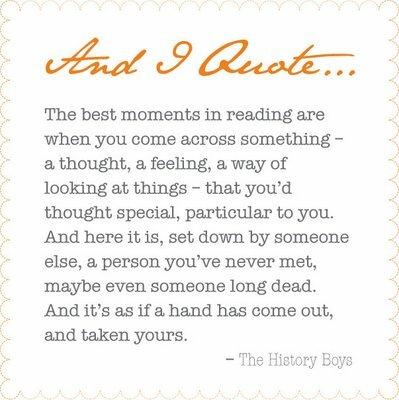 The quote is from the play/movie The History Boys, and the design above is from Design Crush. The Atlanta-Fulton Public Library is presenting a series of events this fall centered around Louisa May Alcott. These events take place mainly at the Central Library downtown, but a couple of them are a little closer to home at the Roswell branch: a Civil War lecture October 1st, and a Noonday Nosh Reading Group discussion of her biography, Louisa May Alcott: The Woman behind Little Women, on October 18th. The Atlanta-Fulton Public Library System is pleased to announce a series of reading, viewing, and discussion programs focused on Louisa May Alcott’s life and the historical and cultural context that inspired her remarkable body of work. Louisa May Alcott: The Woman Behind Little Women is a documentary film co-produced by Nancy Porter Productions, Inc. and Thirteen/WNET New York’s American Masters, and a biography of the same name written by Harriet Reisen. Louisa May Alcott programs in libraries are sponsored by the American Library Association Public Programs Office with the support of the National Endowment for the Humanities (NEH). The library received an NEH grant of $2,500 for the program series. The Library System is presenting a number of programs during September, October and November which will re-introduce audiences to Louisa May Alcott’s story. Programs include a community-wide library event focused on Louisa May Alcott’s life, work, and times; a reading and scholar-led discussion of Alcott’s lesser-known works; a discussion of Alcott as a literary phenomenon and social reformer; and a film screening and discussion of the documentary and biography. Louisa May Alcott is recognized around the world for her novel Little Women, but few know Alcott as the bold, compelling woman who secretly wrote sensational thrillers, lived at the center of the Transcendentalist and Abolitionist movements, and served as a Civil War army nurse. The Atlanta-Fulton Public Library System’s public programs present a story full of fresh insights about Alcott and a new understanding of American culture during her lifetime. We would like to invite you to attend these exciting programs focused on Louisa May Alcott. The first program, “Transcendental Wild Oats”: Louisa May Alcott and Reform, will be held at the Central Library Wednesday Sept. 28 at 1:30 p.m. Dr. Robert Sattelmeyer will be the guest speaker. To see descriptions of all the programs in the Louisa May Alcott series, please visit the webpage here or contact program contact John Wright at 404-730-1745 or john.wright@fultoncountyga.gov. We hope you can join us as we explore Louisa May Alcott at our libraries. 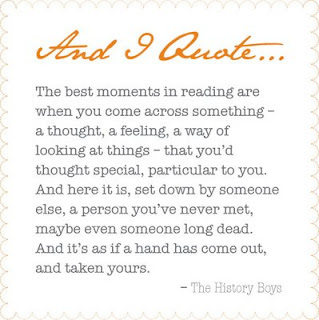 And one link to look back with: What did you really read this summer? from Salon.